I'm headed to Venice next week which has me in a rather sensual mood. Venice is a city for the senses -- the paintings of Titian... the waves lapping against stone... fish pulled from the lagoon and served steaming hot... not to mention it is the city of Casanova, too. But Venice is also a city of music. 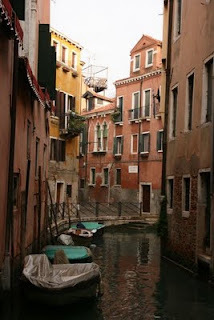 For centuries musicians have written about Venice. The city has launched scores of composers and musicians. And the churches and theaters of the city, including the famed La Fenice, are filled nightly with notes as singers and instrumentalists alike pay homage to one of Italy's most romantic cities. Today, to get you in the mood, I have a Venetian treat for you -- a mix of songs created in, for, and about Venice. I've chosen some of my favorite performers, too, including Bing Crosby, The Sixteen, Joyce DiDonato (who blogs at Yankee Diva), Duke Ellington, and Keola Beamer (yes, even a little slack-key guitar). And for other great travel photos, check out Delicious Baby's Photo Friday. Ciao! This is probably one of the better times to visit Venice when the crowds have dwindled compared with the peak time in summer. Nice selection of music to go along with the journey. Enjoy it. Too funny! When we last visited Venice, I stood outside La Fenice (with husband + kids). The boys were restless so my husband explained that "Mom looks like she's looking at the building but really she's listening to music". And he was right. In my head I was imagining sitting inside watching/listening to Verdi. Lovely photo. Have a wonderful trip. Sounds heavenly! Venice is a magical city. Enjoy your trip. It does look like a romantic destination. Have a great time!